Bad Holly, not blogging regularly...bad blogger Holly. So the Ancestor Award is keeping me “in the game”; Jennifer Trahan @ Jennifer’s Genealogy Blog sent over the award recently. 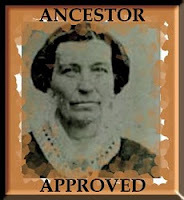 The Ancestor Approved Award asks that the recipient list ten things you have learned about any of your ancestors that has surprised, humbled, or enlightened you and pass the award along to ten other bloggers who you feel are doing their ancestors proud. Hmmm, let me put on my thinking cap, and get another cup of coffee, mandatory! 1) Calvin Wheeler b circa 1789-90 USA d 20 Mar 1866 Canada. My third great grandfather on my father’s maternal side. Everything about him was a surprise, and I was certainly enlightened. First I found him...SURPRISE! Then I found that he was an affluent man in the town HE founded originally called Wheelers Mills, later called Tamworth, in Lennox and Addington County in Ontario. He started a sawmill, grist mill and store. He was the first postmaster, held other titles such as councilman, magistrate and militia officer with rank of colonel and was considered a U.E.L although I have yet to find conclusive records. He certainly has a continent full of descendants, and his Tamworth house stayed in the family for at least 162 years. There is so much more to find on this intriguing man. All of this was lost to our family. 2) Leo Cornell b 3 May 1898 d 16 Aug 1981, my grandfather on my mother’s side. I was both surprised and enlightened to find and receive a copy of his adoption papers, and find his birth family as well as descendants of this family. I have yet to ‘hook up’ with his birth siblings. Grandpa was adopted as was one sister, by a ‘merchant’ family from Canada that migrated to Michigan in the 1800's. 3) Mahlon P. Reynolds b Feb 1832 d June 13 1920. My 2nd great grand father married Sarah Stowe, my great grandfather Wilbur was born...she later died. Mahlon remarried and became apparently estranged from his new wife Elizabeth Clawson who still called herself Elizabeth Reynolds...and a child appears on a census (NOT Wilbur!) SURPRISE! A minor issue, but there are many of those along the way, aren’t there? 4) My grand father, Ernest Raeburn never became a U.S. citizen, living on the border of Canada in Sault Saint Marie, Michigan after marriage. He held the career of Steamboat Captain for Canadian Steamship Lines, technically on land for about 3 months of the year. He married grandma [Ethel Wheeler] in Canada, and grandma had to re-establish her U.S. citizenship, since she married an alien. [That always gets me, sounds like he was from outer space] They had to move to the Canadian Soo during WWII. Surprise! 5) William Raeburn b abt 1810 d 1897...it was certainly enlightening to find all the places the family lived between Ireland and Simcoe County, Ontario, and all of the children we never knew he had. 6) Anna Youker b 1824 d 1899 my second great grandmother on my fathers paternal side, is the granddaughter of a Revolutionary War patriot, Johann George Youker a.k.a. Yucker b abt 1757/59 d 1844. I submitted my line to DAR several years ago online, but received no response..so I suspect I need more documentation. Enlightened. Well, how about 6 ? That is about it for now I think. Would my ancestors be proud? Does anyone else think all of this is interesting...other than me? Te he....hope I didn’t bore you all. I think this one has been all around the block so I am not sending it out. It was an interesting exercise.